Spinach isn't just for Popeye - I love it too. My easy spinach recipes range from appetizers to side dishes and something in between. Not just fresh spinach recipes, but the best vegetable recipes too. 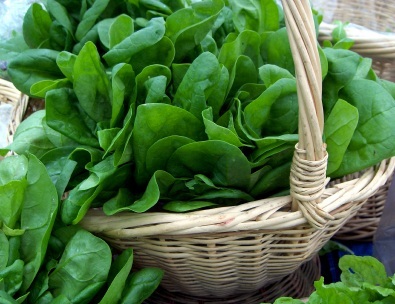 Fresh baby spinach is preferable to regular spinach for raw uses such as salads because of its tender nature. Baby spinach also adds excellent texture and freshness to sandwiches, and can be blanched, microwaved, sauteed or steamed. I use baby spinach all the time and you may want to for the following spinach recipes. To blanch the leaves, boil them in water for 2 to 5 minutes, drain, and squeeze out excess moisture. To microwave, place half of a pound of slightly wet spinach in a covered container. Cook for 4 to 7 minutes or until tender. To saute spinach, spray it with oil and cook it quickly in a saucepan. Spinach can also be steamed for 5 to 10 minutes. Cooked spinach is a tasty component in dips, omelets, quiche, and lasagna. When buying spinach, avoid leaves that are limp, slimy, spotted, blemished, or pale green to yellow. Bagged Baby Spinach should have a date stamped on the bag that will indicate freshness. Moisture will promote spoilage in fresh baby spinach so store spinach unwashed whenever possible. Make sure fresh spinach is dry before wrapping it in cellophane or a plastic bag. Tightly wrapped or pre-packaged, unwashed spinach will last 3 to 4 days in the refrigerator crisper. Are you ready for some awesome easy spinach recipes? I thought so. Following are two homemade easy spinach recipes for dip that are family favorites of mine. They are similar but totally in a class of their own. The first is served cold, and the second you bake in the oven. They both are crowd pleasers. In a small bowl, combine the first 5 ingredients and mix thoroughly. Set aside. Hand squeeze the spinach to be certain there is no water in it and add to the mayo mixture. Place in an airtight container and refrigerate overnight for best flavor. The next day slice off the top and remove the interior of the loaf. Rip these bread chunks into bite-sized pieces to dip with. Fill hollowed loaf with the refrigerated dip and place the pieces around the loaf. Enjoy. In a small bowl, combine the Parmesan cheese, spinach and artichoke hearts. Set aside. In another bowl, mix the sour cream, cream cheese, mayo and garlic together until well blended; and add to the spinach mixture. Horizontally slice off the top of the bread and remove the interior of the loaf. Rip these bread chunks into bite-sized pieces for dipping. Place the dip into the hollowed loaf and bread and place in the oven and bake for 20-30 minutes or until the top is golden brown. NOTE: There are many ways you can serve this homemade dip. I use the loaf of round bread as it is a beautiful presentation. You may also use baguettes - toast them with butter and garlic. Or something as simple as your favorite cracker, it's totally up to you.